Are you suffering from freezing fingers and aching bones this winter? Feeling a bit under the weather? Luckily, you’re living in a country that has the perfect antidote to cold bodies and the winter blues: dipping your entire body in a mineral-rich onsen (hot spring). Onsen towns are scattered across the length and breadth of the Japanese archipelago but if you’re looking for a quick day trip away from the noise and steamy crowds of Tokyo, the Izu Peninsula is probably your best bet. Located just about 100 kilometers southwest of the capital city, the Izu Peninsula has always been a favorite getaway for Tokyoites, particular writers, artists, surfers and scuba divers. One of the best things about the peninsula is that it’s almost completely surrounded by water so in most cases, you can get a double whammy — an onsen soak with an ocean view — and of course, Mt Fuji at nearly a hand-reach distance. Without further ado, here’s our official onsen guide to the bubbling hot spots of the Izu Peninsula. 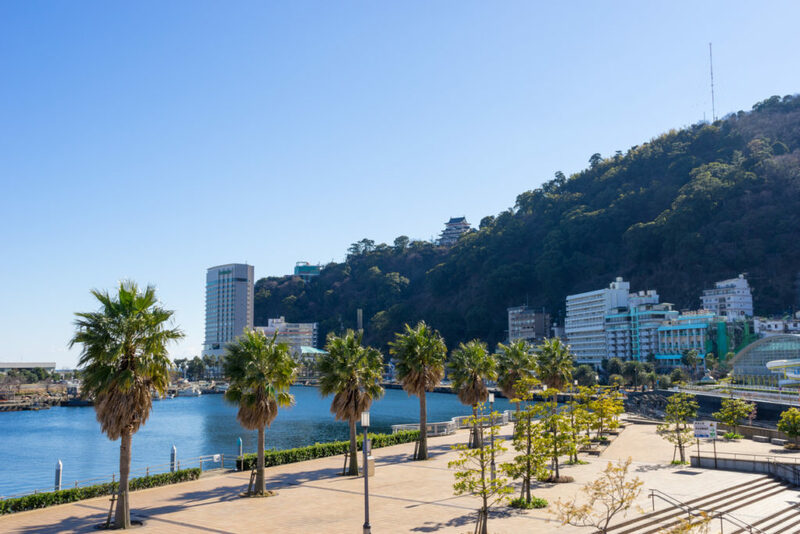 Atami, memorialized in several Japanese movies, is often called “the gateway to the Izu Peninsula.” Less than an hour away from Tokyo by bullet train, it’s been a favorite destination for many. In fact, shogun Ieyasu Tokugawa (1543-1616) loved Atami so much that he carried its onsen water all the way back to his residence in Edo (now Tokyo). Present-day Atami is still teeming with hot spring resorts. Many are located along the coast while others are found in the city’s more mountainous areas. There are also free footbaths like Ieyasu no Yu, located just outside Atami station, and another at Atami Baien, inside the famous Plum Garden near Kinomiya station next to Atami. Atami’s onsens are rich in salts and sulfates, both extremely good at curing minor ailments. Another plus is the fact that many of Atami’s hot springs are directly sourced and the water is not recycled. A great place to also enjoy fresh seafood and other delicious meals, Atami is the perfect destination for a weekend trip.